Jane Jacobs's iconic Death & Life of Great American Cities remains one of the most read and influential texts in urban studies, now 50 years after publication. Surely this year will see numerous celebrations in honor of its 50th birthday, with tributes galore as to how the book helped turn around the seat tide of high modernism, urban renewal and other anti-urban activities that threatened to turn entire cities into the "great blight of dullness" which Jacobs so deplored. Unfortunately, one of the many legacies of the book has been to overemphasize her famous "sidewalk ballet", the iconic story of her beloved Hudson Street in Manhattan. Marshall Berman criticized the lack of attention to the racial inequalities missing on Hudson Street yet embedded in the city; others have bemoaned the gender roles, the nostalgia, or the way in which her vision of public space became so central in movements like New Urbanism, again at the expense of ecological and equity concerns. Yet the real tragedy is not that we fetishize the street, but that we ignore some of the more critical insights in the book, insights which are just as relevant today as when they we first penned. Some of these lesser known ideas are grappled with smartly in Lynne Elizabeth and Stephen Goldsmith's What We See: Advancing the Observations of Jane Jacobs, an edited collection of essays published last year with contributions from a diverse range of thinkers, policymakers and urban activists. But it is recent article in the New York Times' real estate section about an innovation hub on the edge of downtown Brooklyn which illustrates the profound truth behind a little idea buried in Chapter 10 of Death and Life, the "Need for Aged Buildings". Jacobs makes a simple argument - that new commercial buildings have a lot of debt, and thereby must command the highest rents that the market can bear, and thereby limit the type of businesses that can occupy them. Yet start-ups and entrepreneurs can not afford high rents, and since they are the key to regional economic growth - an argument she would make in depth in Economy of Cities and Cities and the Wealth of Nations, long before Richard Florida and the neo-Schumpeterian wave - we must preserve old buildings simple because they are more likely to be paid off. New businesses can rent them for cheap, have the time and space to grow and succeed, and eventually move into newer space - to be replaced by a new wave of new business. This is an argument against redevelopment not rooted in aesthetics or an idea of the good city, which can always be reduced to a question of taste, but of simple economics. New = debt = unaffordability = loss of creativity and innovation. 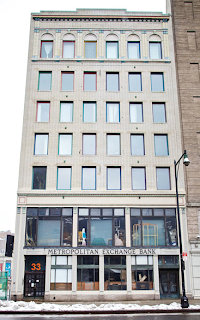 Al Attara's fantastic Metropolitan Exchange Building - the "House of Ideas" - on Flatbush Avenue in Brooklyn is the proof in this urban pudding. Bought for $250,000 almost 40 years ago, Attara has recently turned it into a shared office space for designers, artists, engineers, TV producers and even biotechnologists. None of this would have been possible in the brand new 45 story tower that developers had proposed to build on the site - the debt load would have prevented it, even if the will had been present. As cities around the world look to revitalize and compete, many have tried to build nostalgic streetscapes and expensive renovations of historic buildings in order to capture some of the magic that Jacobs described. Even more are ignoring Jacobs completely and pursuing multibillion dollar neo-modernist megaprojects in the hope of luring the innovative and the creative. Better to follow the lead of Al Attara and others who recognize the importance of the use of old buildings - collaboration, innovation and creation all like one thing, cheap space. Credits: Image of MEx from Benjamin Norman/New York Times. Image of Jane Jacobs at the White Horse by Cervin Robinson courtesy of Jane's Walk. How Similar Can Cities Be?